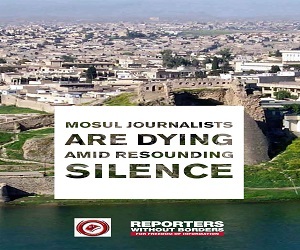 The period between May 3, 2014 and May 3, 2015 has seen deadly operations against Iraqi and foreign journalists, where 34 reporters and photojournalist were killed and wounded and more than 27 others were kidnapped, after ISIL acquired vast areas of the country, where local and foreign journalists used to work actively, which turned those areas to fear and horror zones avoided by field reporters. After these areas fell under the control of the extremist organization in June 2014, the government authorities took series of actions related to media work, communications means, and Internet service. The security services, the Ministry of Communications and the Media Commission blocked the Internet service in most of Iraqi provinces and cities, and tightened control on satellite TV channels and news websites and agencies, in addition to blocking all social networking sites like Facebook, Twitter, YouTube and other services such as Skype, Viber and WhatUp. One of the rare security incidents is that Iraqi Kurdistan Region has witnessed killing of journalists and detention operations and cracking down. The absence of journalists from the scene of communication with many parts of the country made the press coverage of events biased. At a time when extremists had the freedom to control the dissemination of information in the areas under their control, which opened the door to partisan extremist journalists to take over instead of professional journalists, which distorted the big picture of the events that were covered amid contradictory versions. 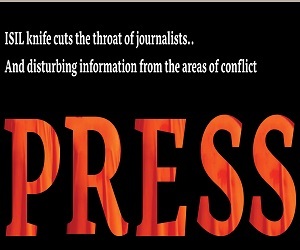 This situation weakened the credibility of the remaining real professional journalists who are trying to report the facts and save media's credibility, which led ISIL elements to practice the most heinous crimes and intimidation against journalists and representatives of news agencies, in an attempt to maintain their freedom in publishing what they want and hide the dark aspects of their operations. After the fierce attacks on media institutions and journalists by ISIL, The Communications and Media Commission (CMC) issued on June 18, 2014 a list of directives and guidelines to be followed by the media. The CMC issued decisions to stop the broadcast of some media outlets and it closed local and Arab satellite TV offices, like (Al-Baghdadia, Al-babeliya, Al-Arabiya and Al- Arabiya-al- Hadath, as well as Al-Jazeera, and Asharq Al Awsat newspaper). The former Iraqi Government re-activated arrest warrants of various charges which were issued against journalists and media activists based on previous laws that exaggerate the punishment for the so-called “publication offenses” and restrict the freedom of the press in a manner agreeable with the repression, tyranny and dictatorship system of the former regime, which contradicts completely with the provisions of the current Constitution. Among the examples of these laws, is the content of the applicable Penal Code No. 111 of 1969, which criminalizes press-related offenses, and enforces strict penalties on journalists. Articles 81.82, 83,84, 201 202 210, 211 215 225, 226 227 403, 433 and 434 of the Penal Code impose fines and long term imprisonment sentences or both together on individuals who are found guilty of committing a range of press offenses, and the law imposes the death penalty on some other offenses. For example, the Penal Code enforces a penalty of life imprisonment or death penalty against individuals convicted of insulting the president, the parliament, or the government; it also enforces imprisonment of seven years for insulting the courts, the armed forces, the public authorities, or government agencies. These laws are in general considered as remnants of the dictatorial regime, and preserving them will significantly undermine the freedom of press and expression. While the field work of journalism and carrying the camera is still very complicated, the official authorities restrain journalists’ movements and tours by military and security leadership orders across all Iraqi cities. Journalists are often banned from taking photos and media coverage unless they receive prior security approvals that are most of the time complicated and arbitrary, despite an order issued by Iraqi Prime Minister, Haider al-Abadi, which abolishes the military guardianship over media teams. Other cases of attempting to control the media, besides the lack of transparency in all the aspects of the state, some official institutions try to control the free flow of information and diminish the level of knowledge among Iraqi citizens and impose censorship and control on the international network (Internet) in the country, and have endorsed other laws to confine freedoms and freedom of expression. Some official, military and security institutions seek to control the information and restrain press freedom of the press, supported by the Independent Communications and Media Commission which exerts sustained efforts to impose restrictions on flow of information and control the Internet in cooperation with the Ministry of Communications. The Security authorities in cooperation with the Ministry of Communications blocked on June 15 of last year twenty (20) news websites, but then they lifted the ban on most of the websites gradually, except for (Al-baghdadiya and Al-baghdadiya News websites, as well as Al Arabiya channel website and Alqurtas News Agency), without providing logical justifications. ISIL carried out execution of three Iraqi journalists. In September 6, 2014, they executed Journalist (Raad Mohammed al-Azzawi), who was working asa photographer with Sama Salah al-Din Channel, only weeks after he was kidnapped from Samra village east of Tikrit, and in February 19, 2014 they executed correspondent of Sama Mosul Channel, (Qais Talal) who was shot dead in the center of the city, and in April 28 they executed Journalist (Thaer Alali), after he was kidnapped from a cafe in Al-Dawasa area, in the middle of the city, while he was “making phone calls with local media agencies to provide them with news”. In June 2014 the extremist organization in Mosul launched a campaign of arrests after ISIL prepared a list of (50) wanted journalists and media assistants. Some Local journalists told JFO that ISIL has arrested more than 14 journalists and media assistants, after attacking their homes in different parts of the city of Mosul, and arrested not only the correspondents and photographers working with satellite channels, but also technicians who were working in optical engineering, montage and management of media institutions. Risks are not limited to the areas where the journalists escaped from after they fell under ISIL control, the battles of liberation conducted by Iraqi forces with all its formations and the international coalition forces led by the United States against the extremist group also caused the death and injury of (34) reporters and photojournalists in the battlefields. In October 2014, press photographer Imad Amer Latufi was killed by an IED targeting the convoy of Anbar Police Chief Ahmad Saddagh, as he was accompanying PC Saddagh while covering the armed confrontations with ISIL. Anbar TV and other channels broadcast video clips shot by Toffee as he was the only war photographer going in conflict zones. On January 23 of this year, Ali Al Ansari correspondent of “al-Ghadeer” satellite channel was killed during armed clashes between Iraqi security forces and ISIL militants in Diyala province, while covering a military operation launched to liberate areas in Muqdadiyah district, where a mortar shell fell on a gathering of forces and media correspondents and photographers in Mansuriat Al-Jabal north of Muqdadiyah, killing Ansari. On August 9, Kurdish journalist Ms. Deniz Furat was killed after shrapnel of mortar shell hit her heart in a camp near the town Makhmur, while covering battles between Kurdish Peshmerga forces and ISIL militants; Deniz was working for “Furat” news agency and other media outlets. On May 13, 2014, correspondent Humam Mohammad of “Change” TV channel was killed in Anbar, after a shell landed near him while filming battles between the Iraqi army and ISIL. On June 14, 2014, gunmen opened fire from machine guns on the working team of “Ghadeer” channel in Diyala province, while they were covering military operations to liberate Adhuim area, which led to the killing of photojournalist Khalid Ali Hamada. On January 20, journalist Nawzad Mohammed was killed in Khormal subdsitrict of Sulaimaniyah province; Mohammed was working with a number of Kurdish media outlets and he used to publish reports on cases of administrative and financial corruption. Over the period from May 3, 2014 to May 3, 2015, the JFO noted that most of the war correspondents do not comply with occupational safety requirements while in conflict zones, and do not wear protective jacket and bulletproof helmet while on the field, causing some of them injury during the battles led by the Iraqi forces against ISIL. Correspondent of “Al-Hurra” channel Maitham al-Shaibani and his cameraman Maitham al-Khafaji, were exposed to bodily injury while covering fierce battles by the Iraqi security forces in Jurf Al-Sakhar area north of Babil; Haider Nassif, reporter of “Afaq” channel and his cameraman Ahmed Khudair were also injured, in addition to the injury of “Furat” channel photographer Ali Rashid. Also this month “Iraqiya” TV reporter Haider Shukur was severely injured while embedded with the security forces and the Iraqi army during liberation of Baiji district, as he sustained serious wounds to his back as a result of a bombing targeting him and a group of special forces soldiers at a time when he was not wearing a protective vest and bulletproof helmet. On January 23, 2015, Iraqiya reporter Mustafa Hamid and cameraman Qusay Saheb were wounded by a mortar shell landing near them while with the security forces in Mansuriat Al-Jabal area north of Muqdadiyah district, Diyala province. Reporter Laith Ahmed was injured by a (Katyusha) rocket landing near him, while covering the military operations carried out by security forces in Mekeshifa area north of Samarra city. An ISIL sniper was able to hit “Iraqiya” correspondent Ali Jawad and his cameraman Ali Meften on 26 December, as they were embedded with the security forces in the area around Tikrit. Ghadeer TV correspondent Ahmed al-Baderi was hit by shrapnel in his hand when a Katyusha rocket landed near him, while covering military operations in Al-Alam subdistrict. “Ishraq” channel cameraman Ahmed Hatam narrowly escaped death while sustaining serious wounds as he was escorting Iraqi security forces in a military operation in Ishaqi district. 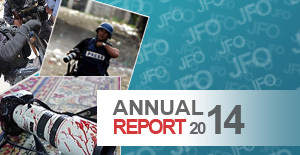 In light of the country’s current security situation, and as a result of the increased journalist workload of media coverage of the events, the JFO perceives with concern the lack of interest by number of journalists for adhering to safety requirements during the press coverage of events in conflict zones. Iraqi journalist Mushreq Abbas said that media institutions should ensure the safety of their correspondents and they need to consider that one of their basic functions, and be held directly responsible for the exposure of reporter to incidents whether by not wearing the press protection gear, or for not admitting reporters in qualifying educational and training courses to enhance their ability to deal with battlefield environment, and their ability to act properly during the coverage of such events. According to statistics conducted by the Journalistic Freedoms Observatory since 2003, 280 Iraqi and foreign journalists have been killed in Iraq, including 169 journalists and 67 technical and media assistants being murdured while on journalistic duty. Mystery also surrounds many of the attacks on journalists and technicians who were not been targeted because of journalistic work. As 74 journalists and media assistants were subjected to abductions, most of whom were killed and the fate of 14 of them is still unknown. Neither the judiciary nor the competent authorities disclosed the identity of the perpetrators of these crimes, the classification of which far exceeds that of any other country in the world. Iraq over the past decade has still been leading the indicators of impunity. ISIL continues detention of eight writers, journalists and photographers in the province of Nineveh, the bulk of whom have been kidnapped since June 10th 2014, including writer and journalist Fadhel Al-Hadidi, journalist Muhannad Al-Ogaidi, journalist and cameraman Ali Al-Nawfali, “Museliya” TV anchor women Maysaloon Al-Jawadi and Egyptian journalist and writer Jamal Al-Masri; while in December of 2014, ISIL has kidnapped three other individuals they are reporter of “Eye News” agency Mohamed Ibrahim and his brother Musa’b Ibrahim, who works as a photographer in the same agency, as well as “ Museliya” TV correspondent Abdul Aziz Mahmoud. ISIL threat was not the only dominant danger in the violence scene against journalists, as JFO has documented many of the abuses practiced by the security authorities and protection personnel of state officials, as field journalists and photographers were subjected to systematic attacks by the security and military forces that extend their grip on Iraqi cities. Many of these cases were intentional and unjustified, in addition to harassing journalists and photographers when detained or arrested, as well as deliberately destroying their recording and photographic equipment and confiscating some of them.